The Bowshiers film a scene with real estate agent Paige Duff at the Tilton Hilton at Indian Lake. The Majors have connecting offices on the lake’s waterfront with beautiful views. Their offices at the Aries office building have a boat dock. Having just bought a home on the lake at Longview Cove, they now can boat to work. 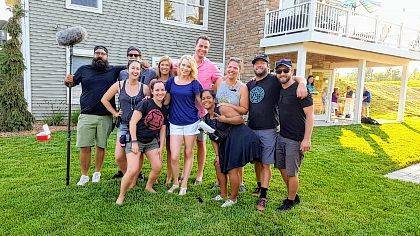 Local real estate agent Paige Duff, center, poses with the production crew of the HGTV show “Island Life.” The house in the background at Longview Cove will be featured on an upcoming episode. Realtor Paige Duff “shows” a home at Longview Cove bought by David and Lauren Major. Local Craftsman Dale Frymyer hand-crafted the table shown. LOGAN COUNTY — It’s a very popular reality show many of us have watched and would love to be on. Families look to find their own little corner of paradise on a beautiful island. Everyday house hunters look for a new adventure or an escape from a hectic lifestyle or just want to get away from it all. This show proves your island fantasy can become a reality. 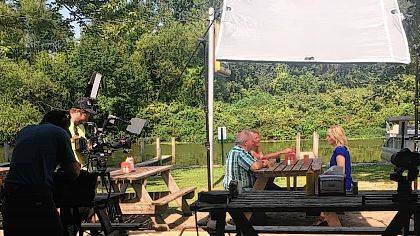 The HGTV show “Island Life,” which has featured many exotic island locations, selected Indian Lake to film not just one, but two upcoming episodes of the hit TV show. Some people even own their own island on the lake. Many homes sell in the $300,000 to $600,000 range and some are well over a $1,000,000. “This is very exciting and big for Indian Lake,” said Pam Miller, Executive Director of the Indian Lake Area Chamber of Commerce. “I love the show and watch HGTV all the time,” she adds. The lake attracts over 1.5 million visitors a year and has been nationally known and respected since the 1950s with its amusement parks and popular dance halls. Today, it is just as popular, if not more, with its luxurious waterfront and island living, fun party-style restaurants and bars, and the many popular annual lake events such as Party at the Beach and HarborFest. “We received a phone call out of the blue one day back in August,” said Marsha Park, Office Manager of Choice Properties in Russells Point, Indian Lake. “Shari Rice answered the phone and the person on the other end said they were calling from New York City and wanted to film a TV reality show at Indian Lake and they needed a local real estate agent to be in the show,” said Park. “Well, she really just wrote it off as a hoax. I thought it was a prank call myself. “But a couple days later it was firmed up when we received an email from the HGTV Island Life TV production crew following up on that phone call and stating that they will be filming their show at Indian Lake and they needed a real estate agent to star in the show,” added Park. “Reality had now just sunk in and we knew this was a not a joke,” said Terry Frymyer owner and founder of Choice Reality. Paige Duff is a local resident, married with two children and loves everything about Indian Lake. She filmed for two weeks with the show. “When they asked me to be on the show, I was honored and jumped at the opportunity to represent and promote Indian Lake. This a great way to showcase and feature our beautiful lake on national TV. As an added bonus it’s a benefit to all of our local business owners,” said Duff. “The production crew incorporated many local businesses into the show including the Tilton Hilton, Cranberrys Waterfront Resort, Indian Head Roadhouse, Spend-a-Day Marina, and the Fion Wine Room,” she added. “The show really gives a realistic approach to island living. It really is affordable. Most people fantasize about it, but this show proves that it’s possible for anyone,” added Duff. 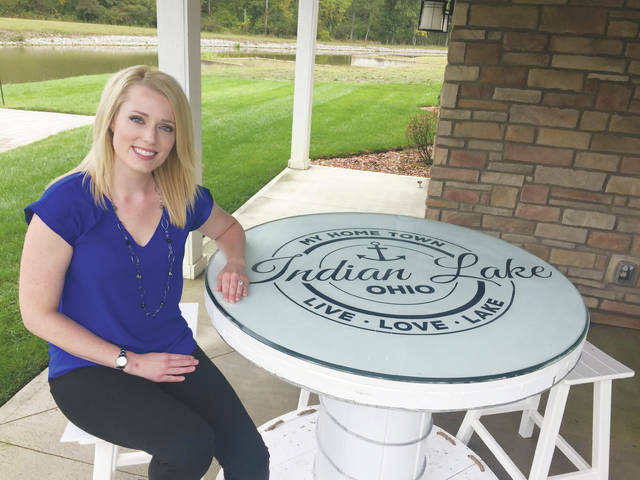 “Our community is so proud of Indian Lake and it will be fun for friends and family to see familiar locations showcased on such a large stage,” she said. Two separate episodes of the TV show were filmed on location at Indian Lake. The first episode features home buyers Shawn and Kerry Bowshier from Urbana. “We were looking for an island vacation home on a lake. There were many options out there from Florida to Tennessee and many others. But when it came down to it, Indian Lake offered everything we were looking for. It’s very close to family, near to some of our other homes and close to our business interests,” said Shawn Bowshier. Bowshier is the owner of Ride 1 (formerly Competition Accessories) in Springfield and owns a second business location in Hilliard. His wife Kerry raises race and show horses including several world champions. “They filmed us looking at four different houses before we decided on the one we bought. We loved the home we bought,” said Kerry, who has decorated the house with rare Indian Lake collectibles and art. The Bowshiers’ home was in the $500,000 to $600,000 range. “It took five days of filming and 12 hours a day for them to shoot our episode. There were a lot of long days and a lot of work, but we are very glad we were a part of it. We just love Indian Lake and are so proud of the Lake and the community,” said Shawn. Episode two features David and Lauren Major of Cincinnati, who were looking for a full-time residence at the lake. David is originally from Urbana and his wife Lauren, a native of Indian Lake, is from Huntsville. Lauren is a graduate of Indian Lake High School and earned a degree in Art Psychology and Fine Arts from Capital University and is also a gemologist and a graduate of the Gemology Institute of America, where she majored in Gemology and Jewelry Design. Her husband David graduated from Graham High School and earned a degree in Industrial and Systems Engineering from Ohio State. Married just two years ago, the Majors live in Cincinnati where David, a systems engineer, is a customer supply analysis manager for Treehouse Foods, formerly ConAgra Foods. 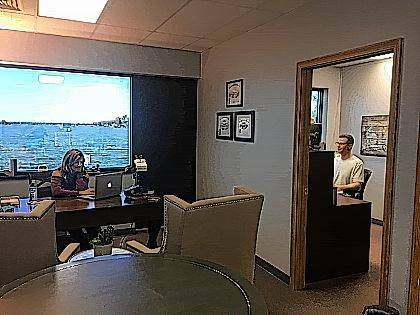 They have decided to move back to Indian Lake full time to be closer to family and Lauren’s jewelry business, called Ray James, which is located right on the waterfront of the lake in the Aries office building. “It’s really the best of both worlds. My husband and I can actually boat to work and home,” said Lauren. David works remotely and has his office right next to his wife’s office at the lake. “We looked at four homes during the TV production and love the home we bought, at Longview Cove, a newly-developed waterfront community,” Lauren said. The Majors’ home was in the $400,000 to $500,000 range. The production crew HGTV brought to Indian Lake to shoot the two episodes consisted of eight members that included two camera men, two production assistants, two producers and two production managers. “It took on average four days and 12 hours a day to produce each 22-minute episode,” said Duff, the real estate agent for both episodes. “The crew rented two lake houses and spent two weeks filming here,” she added. “We are all so proud of Paige. She did a great job,” said Terry Frymyer, Paige’s boss and founder and owner of Choice Properties. “A star is born,” added Frymyer. The Bowshiers shot scenes at four locations: Cranberrys, Tilton Hilton, the Fion Wine Room and a scene shopping for a boat at Spend-a-Day Marina. “One day we had to change clothes six times for different scenes,” said Bowshier. “The crew was great to work with and very professional. They had every hour of every day scheduled and planned out. One day before a scene I surprised them though and pulled out my cell phone and had it playing the famous ‘Indian Lake’ song by the ’60s band the Cowsills. They thought it was pretty cool,” Bowshier added. Officials at HGTV have not released an official date for the two episodes filmed at Indian Lake, but they are expected to air in November or December. Check your local and cable listings or go to hgtv.com. https://www.mydailytribune.com/wp-content/uploads/sites/42/2017/10/web1_FotoShootWeb.jpgThe Bowshiers film a scene with real estate agent Paige Duff at the Tilton Hilton at Indian Lake. https://www.mydailytribune.com/wp-content/uploads/sites/42/2017/10/web1_MajorsWeb.jpgThe Majors have connecting offices on the lake’s waterfront with beautiful views. Their offices at the Aries office building have a boat dock. Having just bought a home on the lake at Longview Cove, they now can boat to work. https://www.mydailytribune.com/wp-content/uploads/sites/42/2017/10/web1_unnamedWeb.jpgLocal real estate agent Paige Duff, center, poses with the production crew of the HGTV show “Island Life.” The house in the background at Longview Cove will be featured on an upcoming episode. https://www.mydailytribune.com/wp-content/uploads/sites/42/2017/10/web1_Duff.jpgRealtor Paige Duff “shows” a home at Longview Cove bought by David and Lauren Major. Local Craftsman Dale Frymyer hand-crafted the table shown. Ron Brohm is a regular contributor to this newspaper.